We often have a nostalgic memories of the good times and people of years gone by and when Ping announced the TR 1966 Anser putter my mind flashed back 48 years ago to the original Anser. You might asked how can I remember that far back, least of all remember a putter and the answer is an old photograph taken on a practice green showing me with a Ping Anser in my hand. 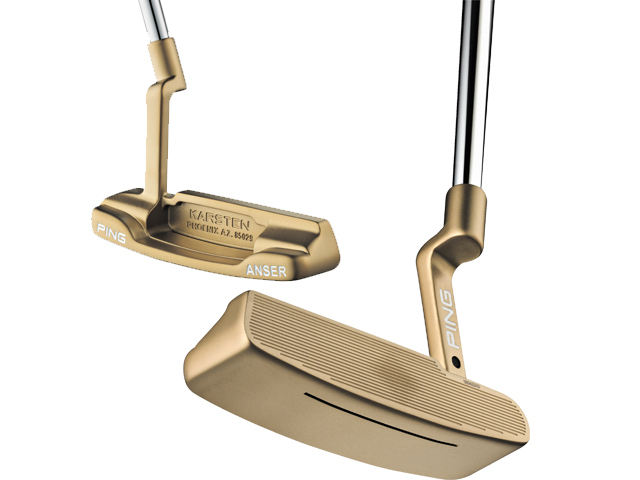 The original Anser and Anser 2 sold for $20 and didn’t make the sound “ping” like Karsten Solheim’s first putter but they shared the heel and toe weighting that revolutionized putter performance. Ping has reintroduced the Anser and Anser 2 models as the TR 1966, certainly a fitting way to mark the 50th year of the iconic shape which has been copied hundreds of times by putter makers. Both TR 1966 models were designed using three dimensional scans of the originals to get the subtle contour details Solheim crafted back then using a mill and hand files just right. And the new Anser retains two features I like the most. There’s no alignment mark on the top and the sound is impressively solid, a result of the slot in the sole and since one of the critical factors in a putter’s feel is the sound, this works very well. It would be great to say that after ten rounds I was making everything I looked at but that’s not the case. What did happen though was my putts per round stat dropped by almost half a stroke and that includes two rounds on greens I would guess were 12 to 13 on the Stimpmeter. Bottom line is I just like the looks and the feel which of course breeds confidence and confidence means you make more putts. The TR stands for True Roll, which is what Ping calls the milled grooves on the face, the only significant departure from Solheim’s original while the manganese bronze PVD finish is actually better than the original. The Anser 2 has a stainless steel blast finish with one alignment line on the flange. Heel and toe contours are somewhat less rounded than those of the Anser and the Anser 2 top rail is a little narrower. Both retail for $162.50, not bad a price for a trip into the past. By the way, back in 1966 the name Anser was suggested by Solhiem’s wife, Louise. He wanted his new putter to be the “answer” to a competitor’s model and both of them liked the name Answer but it was too long to fit in on the flange. Mrs. Solheim said the “W” could be left out since the name would still sound the same. Pure genius. Love the trip back! 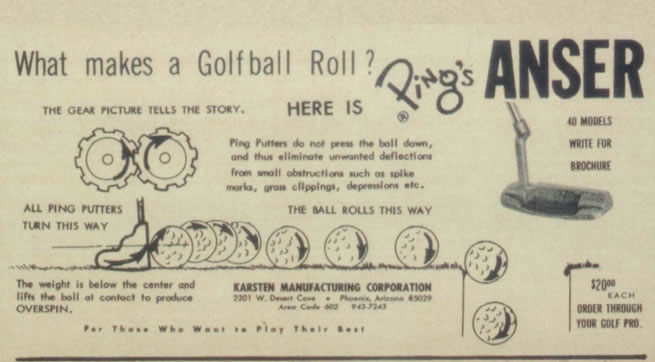 The original Ping was fun. . .but the Anser does answer a lot of the questions! Great article!